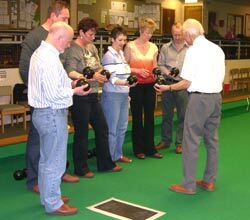 If you are new to the game of bowls or would simply like to improve, we offer coaching courses of two hours a week for four weeks. Please contact the centre for further details. All our coaches are fully qualified and because the groups are kept small, you will receive personal attention. Bowls and Bowling shoes are provided free. This offer presents you with an ideal opportunity to try out a new sporting activity, with the friendly help of enthusiastic and experienced bowlers, in a first rate facility. Why not come and try it, you never know how good you might be. 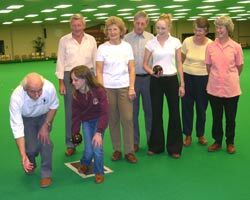 A first taster-session is offered FREE, followed by four sessions costing £20.00 payable on your second lesson – which, if you subsequently join the Bowls club as a member, gets knocked off your joining fee!